Alex Rodriguez was just suspended through the end of the 2014 season and many others have also been suspended for their alleged use of prohibited substances. Is this right? Does Major League Baseball have some hypocrisy on the impact that these substances have on the game when other things that they do allow have extreme impacts on the game? New Orleans is playing around with a horrible idea to fund the ferries. How could this have been stopped? What other examples would be better for ferry users? And what little nugget did I find on the stop the tolls website do I find most ironic? New Orleans has some major failures when it comes to education. I will go into some of them as well. The Liberal Dan Radio Kickstarter is still underway. Consider sponsoring the show or supporting it with contributions as low as $1. 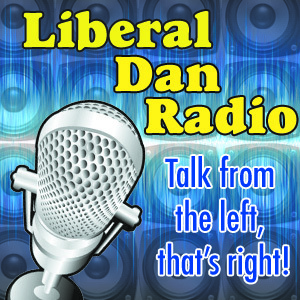 Those topics, headlines, words of redneck wisdom, and more all tonight on Liberal Dan Radio: Talk From The Left, That’s Right! 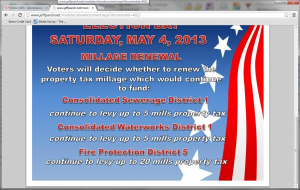 Specifically, information on the Jefferson Parish website about the May 4th election (and early voting dates) leaves out the fact that the toll initiative is on the ballot. It has been argued that lower turnout helps the anti-toll crowd. 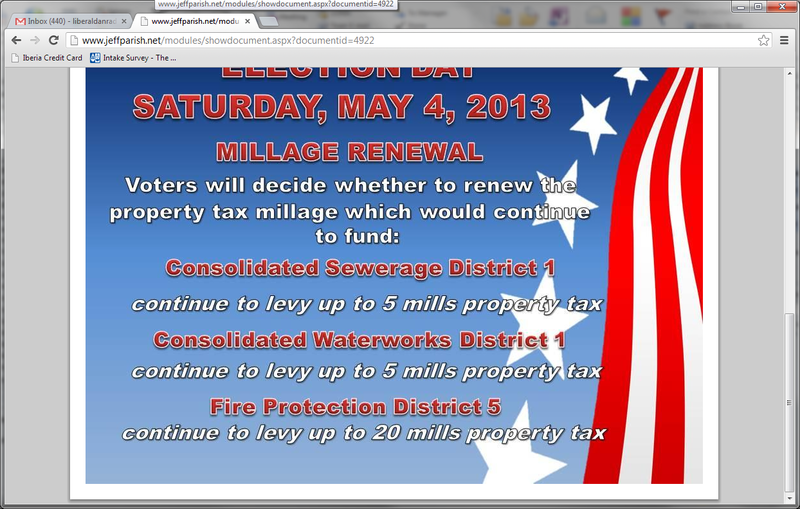 So is the Parish of Jefferson leaving the information for the toll renewal off of their website to keep turnout down? It’s not about the tolls anymore. UPDATE: I have created a new Facebook Group to Stop the May 4th Toll Disenfranchisement. Join now! In a previous post I had stated I was glad that the judge ruled against the tolls because it would give people time to see how life without the tolls would be. This would at least paint a partial picture so people could get a more informed view of the results of having no tolls on the bridge. However, as I have had time to think about the results, the problems of having this “re-vote” are becoming more and more apparent and the attitudes of many of the anti-toll activists are shining through as clear as day. We were told by G. Patrick Hand (attorney for Michael Teachworth, head of stopthetolls.org) that the reason for the lawsuit over the result of the election is to “ensure the integrity of the election“. However, after the election, Michael Teachworth gives a contradictory statement as to what this was all about. He states: “This is really about the little guy getting another shot, that’s what this is all about.” So what is it? Is it about making sure the election maintains its integrity or is it about the “little guy” getting another shot. Well this isn’t Rocky II nor is this about maintaining election integrity. This is about the “no tolls” faction making sure that their side wins no matter what. It is about the ends justifying the means. It is about “stop the tolls” making sure as FEW people vote on this proposal as possible. When they couldn’t win convincingly at the polls, the group pushed to disenfranchise the thousands of voters who cast a valid ballot for the hundreds of voters who turned in a legal provisional ballot but were not able to cast a vote on the toll issue. Let’s be very clear. People who were unable to vote should be allowed to vote. Louisiana law allows for this remedy without tossing out the legally cast ballots of others. The same statute used by the judge in this case to call a re-vote also allows a call for a “restricted election” where only certain voters are allowed to vote. If the stop the tolls organization really wanted to maintain the integrity of the election and make sure that as many legally cast ballots were counted, they would have pushed for this remedy and not for the remedy that throws out thousands of legally cast ballots. However, with the exception of one very loud liberal friend of mine, most of the people who I have met who oppose the tolls are Conservatives. They are the kind of people who think that winning at all costs is OK. Their mindset in this election is like the PA GOP who gerrymandered districts because they won state elections in 2010. Their mindset is like the Republicans in other states that want to make it so that the winner of a state’s popular vote could get less than half of the electoral college votes. To them, the ends justify the means. To me, they do not. Thousands of people should not be asked to vote twice in order for hundreds to vote once. Just allow everyone to cast a vote once, count the votes, and let the election results speak for themselves. If at the end of the day those voters care enough about the issue and they come out in opposition to the tolls and they lose, then so be it. They will be gone. But the possibility exists that even if none of those provisional voters come out on May 4th that the election could still be overturned. How on earth is that “fair”? How on earth is that maintaining the “integrity” of the election? Why the toll ruling is a good thing. Earlier today the election to continue the tolls on the Crescent City Connection was thrown out and a new election was set for May 4th (May the Fourth be with you). The reason given was that provisional ballots that were given to voters only contained federal candidates and did not allow for those voters to cast ballots on the toll issue. Whoever was responsible for those provisional ballots needs to be reprimanded because this, on top of our recent water issues in the City of New Orleans, is helping to prove that we are just a third world city. But while the ballot integrity may make the re-vote a necessity, it is not the reason why I am happy the re-vote will happen. See, back during the election I made this post about the Crescent City Connection toll election. I made some claims about how traffic conditions on the bridge would become worse without the tolls. I witnessed some of this first hand after hurricane Issac. However, it was not really possible for me to prove it. We couldn’t have asked for a “dry run” so the voters could see what a toll free bridge would be like. Now that we will have two whole months without tolls, the drivers on the Westbank who commute to New Orleans every morning will witness what happens to their commute first hand. If I am wrong then great, the tolls will go away and I will admit that I am wrong. However, if I am right…. if the traffic becomes more congested without the regulating impact of the tolls to help ease the flow from 12 lanes to 4 and if there are more accidents because people are travelling at higher rates of speed as their cars are required to merge down to 4 lanes then the people of the Westbank will see what I have been saying all along and will realize the 40 cents of tolls they pay each day to travel to work will be worth the shortened commute time they are given by having well regulated traffic going through the toll booths. Mike Teachworth of Stop The Tolls is happy that the Westbank voters will get another chance to stop these “unfair tolls”. Well, I personally do not consider the tolls to be unfair because I also believe that people who use a bridge should be the ones who pay for the maintenance of the bridge. But I think Mr. Teachworth will also be sadly mistaken when more and more Westbank traffic goers learn just how badly the traffic can get when the tolls are gone. Update: People seem to think that two days of traffic is proof that I am wrong with my fears about how the traffic may have issues. It obviously is not. And I may very well be wrong about the traffic and if I am I will definitely admit it. However, the biggest concern is the people merging from 12 lanes to 4 at a faster rate of speed than they were doing so previously. This, to me, would obviously be less safe. Does that mean more accidents will happen every day? Obviously not. However, I do believe that in heavy traffic times we will see an uptick in accidents that take place over the next 8 weeks. And again, if I am wrong I will admit it. I am just asking the anti-toll folks to also have an open mind and look at the data we are able to collect because of this ruling. Toll Opponent Proposes More Tolls? State Rep Pat Connick opposed the Crescent City Connection tolls when they came up for a vote last year. However, he is now proposing a new set of tolls to be placed on drivers who enter onto the Lakebound Expressway from three exit ramps in the Central Business District. Connick believes that the tolls will stop a traffic issue that takes place in the afternoons as the drivers from the west bank are trying to cross over the bridge through the toll plaza. I guess he believes that by slowing down people as they enter the expressway that the traffic would be less backed up on the expressway? Perhaps he believes that some people would take alternate routes to skip the tolls and as such the total traffic on the expressway would be lower? Rep. Connick must not drive in that area much. I would urge him to just look at the absolute mess that is the intersection of Baronne and Calliope to see how already backed up that area is. Adding more of a backup getting up those ramps on that side of the river is absurd. Connick believes that the tolls will help evenly spread the responsibility of the upkeep to east bank drivers as well. I reject this argument. The tolls on the bridge cover drivers on the bridge regardless of what side of the river they come from. If you go from the east bank to the west bank, on the way back you will pay the toll. So it seems silly that someone who most recently opposed tolls is now for them and wants to tax people who likely don’t use the bridge to make it “fair”. It also seems silly that a couple of toll ramps will make the traffic jam in the afternoons on the bridge. I would be more likely to believe that the traffic has more to do with the sun in the eyes of the drivers crossing in the afternoon than some lack of tolls. Needless to say, I will need to see more information about the plan before fully coming out against it. But at this point, it just seems silly. In an op-ed, Louisiana Governor Bobby Jindal stated his support for allowing birth control pills to be made available over the counter. He also stated that he opposes the requirement that insurance policies not only cover oral contraception but do so at 100% first dollar. To some it might seem counter-intuitive to support increased access to oral contraception while also seeking to allow employers to not cover oral contraception in health insurance policies (that are paid for by the work of their employees). However, by making oral contraceptives available over the counter, the pills would no longer be covered under an insurance plans prescription coverage. So not only would Jindal make sure that his religious fundamentalist buddies would get their way by allowing them to offer their employees insurance without oral contraception coverage, he would also end up making it harder to obtain birth control (especially for those women who cannot use the simple generic version of the drug) because it would no longer be covered at 100% first dollar . When I first heard of his support for making oral contraceptives available over the counter I refused to believe that he was doing so to increase access to birth control for women. All I needed was a little time to uncover the method behind Jindal’s madness. So for those people who believe that Jindal has all of a sudden become more friendly to women’s issues, don’t kid yourself. That will never happen. Update: Other bloggers have also seen through this facade. Why Bobby Jindal is not your Birth Control Buddy also points out that this is about reducing access to oral contraception and questions Jindal’s inclusion of age into the argument. Update 2: It is a little disturbing that Think Progress believes Jindal is waking to popular opinion and is pushing for increased access to birth control coverage. He is, in fact, distorting popular opinion to push his radical right wing agenda of restricting access to women. Many workers in the City of New Orleans use the free parking under the expressway in order to save money for their families. The City of New Orleans has blocked the area off for parking and intends to permanently close it in with a fence. This is being explained as being done to prevent the homeless from congregating in the area. Dealing with poverty and homelessness in New Orleans will not be accomplished by building a fence and moving people around. We cannot just sweep homelessness under the rug and expect our problems to be solved. We need real solutions to combat poverty and homelessness by empowering those people, not by shuffling them to different locations and preventing people from using free parking. The reasons given for the closing of the area are to “remediate a health hazard”. What is that health hazard? Are people who parked under there under any health risk from parking there for months? This needs to be explained as well. So we ask that the city explain this health hazard to make sure that the people who have parked under there are safe. We also ask for the city to find alternative ways to deal with homelessness and poverty that are more productive and for them to not eliminate the access to free parking under the bridge. Update: After months of trying I was finally able to get through to someone from the New Orleans Interagency Council on Homelessness. She was not able to answer all of my questions. What she did answer actually left me with more questions than answers. I was told that allowing the areas under the bridge to be open was an “attractive nuisance” and that the area needed to be closed in order to keep the homeless away. She claimed it was for their safety because some homeless people had been victims of crimes. Attractive Nuisance laws are typically requirements to put up a fence to prevent kids from coming into your pool and not for keeping the homeless from sleeping under the bridge. And because shelters can deny access to people with alcohol, drugs or weapons, I am uncertain how many homeless are actually helped with this new regulation. She also told me that maintaining the area under the bridge is expensive and that New Orleans has taken on that responsibility after Louisiana handed over the responsibility to them. She would not tell me how much those costs are and what percentage of costs they are as compared to the cleaning of the rest of the downtown area. So I have to reject the notion that the added costs of keeping the area clean are that much more than the cleaning of the rest of the streets. I still have not been told what exact law allows the city to close that area indefinitely, what the health hazard was that needed to be remediated, on what date the city took over the maintenance of the area under the bridge, and when (or if) the area will be opened back up for parking. I was told that it was closed “indefinitely” for “free parking” which seems to suggest they are looking at handing the area over to parking companies so they can handle the maintenance. Though, she denied that this was what her words meant, her mentioning free parking makes me consider that as a possibility. I believe now more than ever, that this is just an attempt to sweep homelessness under the rug during the Super Bowl and Mardi Gras. I do not believe it will help the homeless in the short or long term. It also hurts the residents of the city who work in the Central Business District and have less access during this time. It was reported that there was a woman who was allegedly burned in a racist attack. Now, the police are reporting that the story was made up. There is a claim that evidence points to her holding the lighter and the fluid. Some people are claiming that she confessed to doing it herself. However, others say that she can only blink to communicate. At this moment, I do not know what to think. I cannot say that I have faith in small town authorities in dealing with violent crimes against minorities. However, it is also possible that she is a sick individual that needs help. That being said, I do not think there should be any quest for fast judgement. Let whatever authorities do their job. If it turns out that she really didn’t do it to herself then people should be found and punished. However, if it turns out that she really did do it to herself, then she is someone who needs serious therapy. I have no faith that with Jindal leading this state’s mental health services into the ground that this woman would get the help that she needs if she really needs help. And that is the sad part of this story. Either we have another victim of a racist violent crime or we have another victim of Jindal’s harmful cuts to our state healthcare system. I understand workers need to eat and sleep and need breaks. I am cool with that. I also understand that you have a limited number of trucks that can be manned at any given time to work on the power lines. But why doesn’t Entergy have more personal than equipment so that while crews are taking breaks, the other crews can be using the equipment? This way you would never see equipment just sitting in a parking lot. It is very simple. Have two crews per truck. Each crew works 11 hours in the field. The other hour is used getting back to wherever the crews swap the trucks. Then the other crew goes out for 11 hours. This way you would have at least 22 hours a day of Entergy working to restore power to the citizens of Louisiana. That the CEO of Entergy couldn’t figure this out makes me tend to agree with John Young that he should resign.